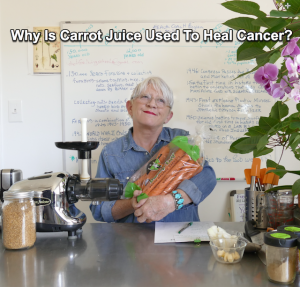 Why Is Carrot Juice Used To Heal Cancer? When I set out to heal myself of cancer naturally, I consumed a lot of fresh organic carrot juice every-every-every day for a year. My countertop was piled high with carrot pulp. I lived with stained orange lips and orange pee. I often added apples, celery and lemon to the mix. I also followed a structured protocol created by Dr Ann Wigmore of eating 3 live food vegan meals and learned to love wheatgrass juice. I turned my kitchen into a ‘Green Healing Workshop’. I learned to give myself wheatgrass enemas and ventured forward into colon hydrotherapy sessions weekly. Saving your life is not for sissys, but the result was the return of my precious life and a gal who emerged a whole lot smarter about taking care of herself. Up till that point in my life I had never owned a juicer or consumed carrot juice, let alone buckets of it. 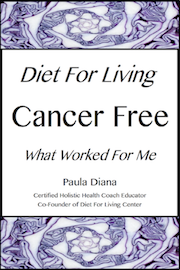 Yet carrot juice as an important component of any cancer healing diet is not new. Dr Max Gerson’s anti-cancer diet “The Gerson Therapy’, developed in 1930 and still used today, prescribes 13 pints of carrot juice a day. Carrots have been on Earth since time began. But they were not always orange. The Dutch started to breed orange carrots in the 17th century as a tribute to ‘William Of Orange’. The Dutch, who have a tendency to go overboard when they love something (think tulip bulbs! ), started growing orange carrots in abundance until no one had any memory of carrots in any other color. The up-side was the vivid orange pigment, which contains beta-carotene. Beta carotene is now known to fight cancer, reduce inflammation and support the immune system. Beta-carotene is a carotenoid. Carotenoids are a class of phytonutrients, a plant chemical shown to have cancer fighting powers. Carotenoids act as strong antioxidants that serve to neutralize free radical damage. Carrots also contain ‘luteolin’ a bioflavonoid shown to induce apopotic cell death in a variety of cancers, and also inhibits cancer cell proliferation and suppresses tumor angiogenesis (angiogenesis refers to the development of new blood vessels within tumors). There are many reported success stories from carrot drenched therapies, including my own. I am now cancer free for 13 years. Want To Know More About Using Food As Medicine? We invite you to join us in the New Year 2019. Become a Certified Holistic Health Coach. Improve you life while you help others. BECOME A CERTIFIED HOLISTIC HEALTH COACH! Join us in January for our 100% on-line Program! Registration has begun. A $300 deposit holds your place in the training. If you are looking for a Program that helps you take your clients to the next level, while cheering you on as you grow as an educator, you have found your new tribe. Please Share Us With Friends Also Seeking A Career That Makes A Difference! Join Us Today For A Better Tomorrow!